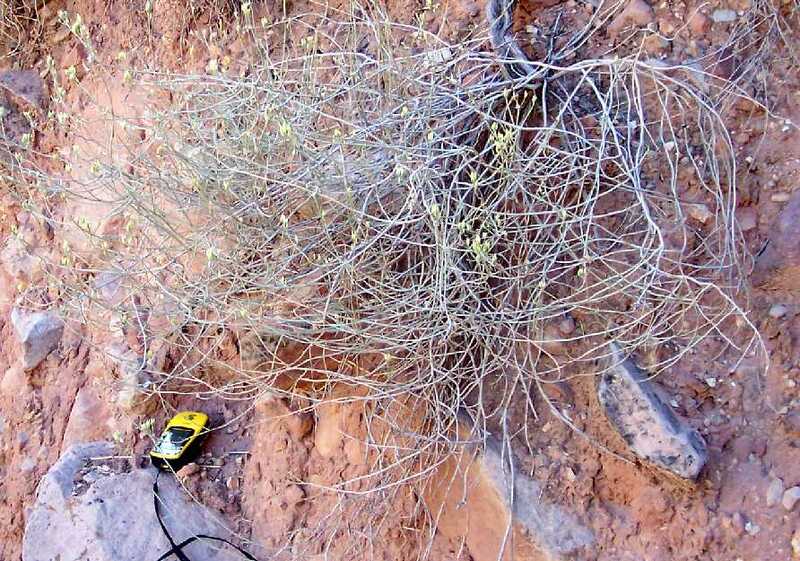 This species was previously known as Chrysothamnus nauseosus var. junceus; it was only recently transferred to Ericameria. See New Names for These Subspecies. Identification status: 95% confidence. I haven't observed flowers in bloom yet to make 100% sure of the taxa, and I need to check the achenes (seeds) to make sure they are hairy. 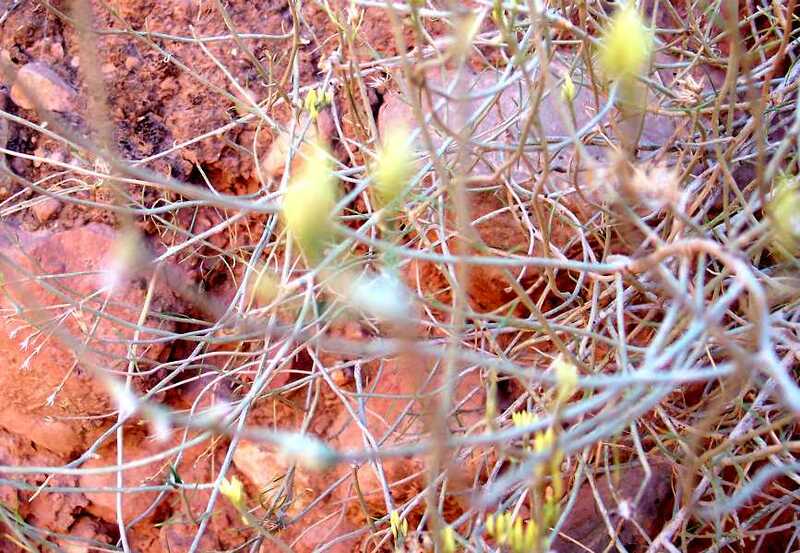 The overall appearance of the plant, and its flower buds, strongly indicate that it is Ericameria nauseosa var. juncea. Ericameria nauseosa var. 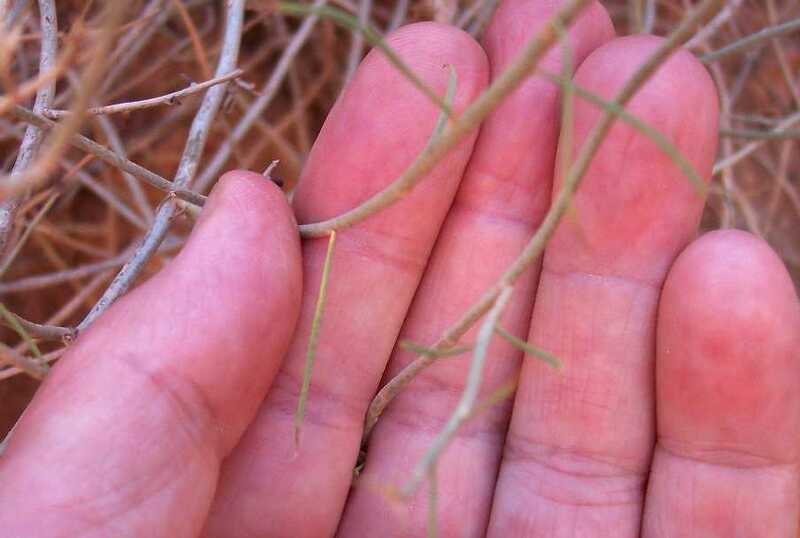 leiosperma is a somewhat-similar taxon, but that determination seems unlikely since its leaves are glabrate, unlike the observed tomentose leaves (see pictures below). Also, var. leiosperma is apparently rarely found in this area; vouchers are only at about 6000 feet elevation, significantly above the 4235 feet elevation of the specimens here. See Chrysothamnus nauseosus (=Ericameria nausosa) Subspecies With Glabrous Involucres At And Near The Grand Canyon, Arizona for much more information about this species and its varieties at the Grand Canyon. There are two subspecies of rabbitbrush on this trail, which are very easy to tell apart when they are in bloom. Variety juncea is found only below 4300 feet elevation, with the first specimen at mile 3.65. It has no leaves present at bloom time. Variety oreophila is found on the upper part of the trail, and is widespread throughout the Grand Canyon Village area. Its leaves are present at bloom time, looking noticeably green below the flowers. Compare the pictures of var. juncea in this page with pictures of var. oreophila at the trailhead. Variety juncea is also a significantly shorter plant. Kearney and Peebles says that var. juncea is found only in Arizona, but the Flora of North America also says it is found in NV and UT. USDA Plants also give it in CO and NM. From a SEINet search on 25 September 2007, there are 14 vouchers of this species from the Coconino County portion of the Grand Canyon. The nearest are at: Tonto Trail, ca. 150 yds. NW of where Tonto Trail crosses Cottonwood Creek at an elevation of 3760 feet; along Clear Creek Trail at an elevation of 4257 feet; and Ca. 5/6 mile (as raven flies), NW of Bright Angel Creek, above and west of Phantom Creek at an elevation of 3820 feet. A Prunus fascisculata voucher from this trail at 3655 feet elevation gives Ericameria nauseosa var. juncea as an associated species. Note that there may be additional vouchers at other herbaria not available through SEINet. First occurrence on Bright Angel Trail: mile 3.65, elevation 4235 feet (2086 m). Number of plants along Trail: The trail was surveyed for only 0.1 mile past the first specimens of this taxon, so I don't yet have a good estimate of its abundance farther along the trail. 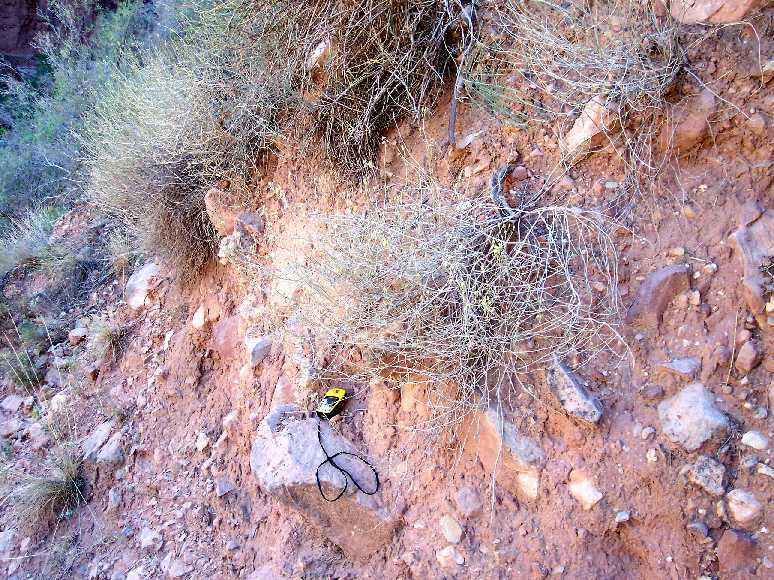 About five plants were found in the single observed location in September 2007. In the next three pictures, note the near absence of leaves. 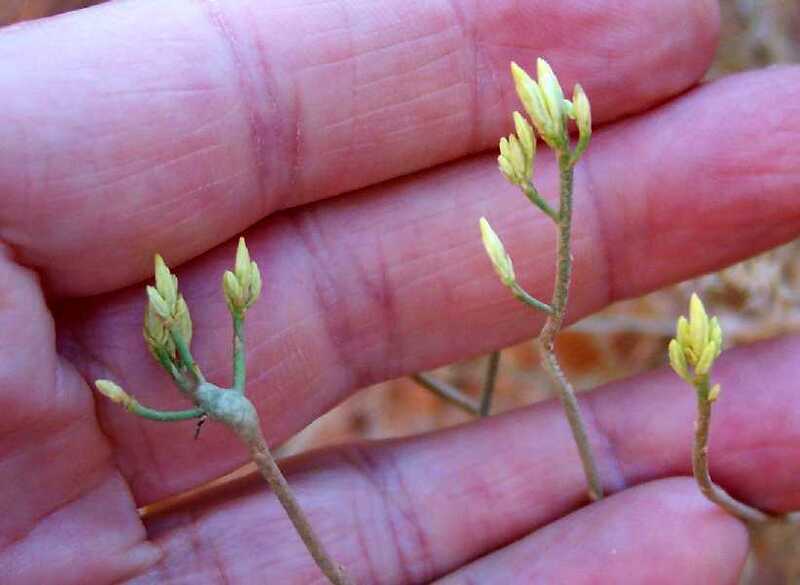 The buds appear to rise from totally naked stems. In the following two pictures, note some leaves are actually still present, but they are drying up and falling off the stems. The leaves are filiform, similar in shape to the leaves of var. oreophila. The following picture shows the vertically-ranked phyllaries (meaning that they line up in distinct columns). The enlargement of the stem just below the buds on the stem at the left may be due to an insect gall.